RIVERSIDE, Calif.—A team of scientists from the USDA Forest Service's Pacific Southwest Research Station and the University of Córdoba in Spain recently developed a new methodology that measures the economic impact of forest fires on timber resources. When evaluating and planning fire management program activities, it is important to know the value of the forest ecosystems protected. However, determining the true volume or economic value of the resources lost during a fire can be difficult. 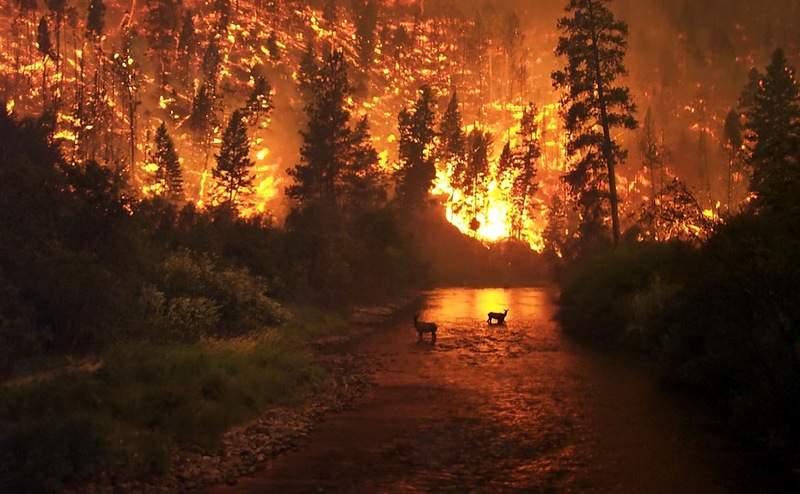 For example, when a fire burns through a timber stand, the market value lost can be calculated from the amount of trees destroyed. However, this does not account for the remaining trees in the stand that survived, but may have been so weakened that they are no longer a viable timber resource. To address this gap, scientists developed a new methodology that takes into account timber vulnerability (potential damage), timber harvesting (economic value) and fire behavior (potential fire spread). Specifically, they examined tree stand age, natural regeneration, existing stock volume, estimated mortality of the remaining trees after fire and potential fire behavior. The methodology provides an estimate of the potential net losses from timber production and fire survival probability over different species and stand development stages. Using Geographic Information Systems, the research team also obtained information on species composition, stand density, and spatial distribution. This information helped the team evaluate fire behavior based on potential occurrence and the spatial characteristics. The study area included all 1.3 million acres of forest of the Córdoba Province in southern Spain's Mediterranean Basin, composed mostly of oaks, pines, aromatic plants, and brush and other understory. “This work is important because it provides fire managers and planners, as well as budget officers and coordinators, in the U.S. and worldwide a simple, reliable and efficient way to estimate economic impacts of wildfires on timber resources, thus making possible the economic evaluation of investments in fire management programs,” says Armando González-Cabán, a PSW research economist who co-authored the study. The team's findings are detailed in a recent paper published in the Journal of Environmental Management. Headquartered in Albany, Calif., the Pacific Southwest Research (PSW) develops and communicates science needed to sustain forest ecosystems and other benefits to society. It has research facilities in California, Hawaii and the U.S.–affiliated Pacific Islands. For more information, visit www.fs.fed.us/psw/. Science that makes a difference. . .